Pictured (l-r) at the prestigious Urbanisation Awards were Caroline Phelan, Galway City Council, Debbie Aplin, Crest Nicholson (sponsor of the award), Galway City Mayor Cllr Terry O'Flaherty, Helen Coleman, Galway City Council, and Professor Kevin Murray, chairman of The Academy of Urbanism. 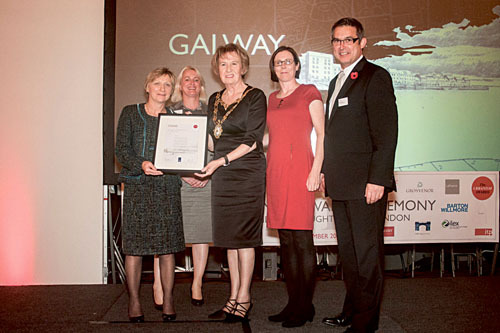 High performing universities, strong IT sector, international tourism, and a strong focus on a year-round events programme are what keeps Galway at the head of the pack and won it the title of 2013 Great Town at the Urbanisation Award ceremony held in London recently. It was these qualities that judges cited as the reason why Galway was crowned this year’s Great Town beating strong competition from UK towns Falmouth and Shrewsbury at last Friday’s awards which recognises the best, most enduring or most improved urban environments. The event is run by The Academy of Urbanisation, a UK based group whose memberes include industry-leading architects, planners, engineers, developers, and designers. The awards acknowledged how “as one of the fastest growing towns in Europe since the 1960s Galway has weathered the recent economic storm through its diverse offerd to residents, business and visitors”. In May the academy had produced a shortlist of 12 British and Irish and three continental European finalists for the awards ceremony which was held at The Grand Connaught Rooms in Covent Garden. Votes were taken from 500 academicians to pick one winner per category based on assessment visits to each location during the summer. Other winners included Antwerp which scooped The European City of Year award, Brixton in London which was awarded The Great Neighbourhood Award, Hope Street in Liverpool which won The Great Street Award, and City Park in Bradford which won The Great Place Award. The assessement carried out in Galway earlier this year concluded, “The assessment team came away from Galway with a real sense that our hosts from the public, private, and community sectors really do enjoy and take pride in working together - and achieve much more as a result. There is a pride in being Galwegian; there is also an openness to new ideas and people.